Brooklyn, N.Y., native Jay-Z (along with his bodyguards — he's not crazy) shocked, surprised and delighted some weekend commuters when he hopped on a Brooklyn-bound R train Saturday afternoon on the way to his eighth and final performance at the Barclays Center. Unfortunately, the video is no longer available. 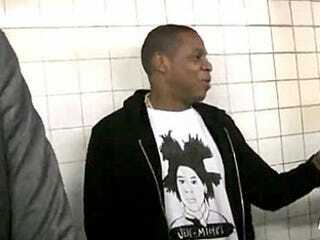 But Jay-Z's subway trip wasn't the only surprise of the evening. Later, Beyoncé joined him onstage for an unannounced joint performances of "Crazy in Love" and "Forever Young." Read more at E! News.